Like other South-East Asian nations, the Vietnamese have a strong and long-standing affinity to gold. In Vietnam, gold is used as a traditional savings mechanism and has even been used as a unit of account for property and automobile transactions and as a unit account for transaction not involving gold. Gold’s store of value characteristic also makes it popular as a hedge against the depreciation of Vietnam’s national currency, the Vietnamese Dong (VND). Gold’s role in Vietnam extends to a medium of speculation, and betting on the gold price has also been a popular activity, especially during the 2008-2010 period when gold trading floors proliferated in the major cities. The 2 major gold trading centers in the country are Hà Nội and Hồ Chí Minh, although the large gold traders and banks quote gold prices for other cities such as Đà Nẵng, Nha Trang, Cà Mau, Buôn Ma Thuột, Huế and the province of Bình Phước. In 2012, Vietnam’s central bank, the State Bank of Vietnam (SBV) estimated that the Vietnamese public held between 300 and 500 tonnes of gold . However, many of the free market and monetary functions of gold in Vietnam have come under increasing fire by the Government and central bank in recent years, via a number of explicit interventions and controls, as they attempted a) to control the domestic price of gold and keep it from spiking significantly above the international price, b) lock down the gold market under State control, and c) reverse what they perceived as the ‘goldenization’ of the Vietnamese economy. 9. A National Gold Exchange? Vietnam’s national currency, the Vietnamese Dong (VND), is not freely convertible. Since 2011, the official VND rate vs the USD has followed a crawling peg system. Within this mechanism, the actual VND/USD rate is allowed to fluctuate in a pre-defined trading band against the official rate (most recently +/- 3%), with the VND regularly devaluing against the US Dollar. The VND was last devalued by 1% against the USD in August 2015 when it was set at VND 21,890 vs the US Dollar. With the VND officially set to a certain value against the US Dollar, the SBV then intervenes in the domestic currency market, attempting to keep the Dong within the prescribed trading band. The local price of gold in Vietnam is quoted in Vietnamese Dong (VND) per Tael. This Tael weight, which is known as cây or lượng in Vietnam, is equal to 37.5 grams or 1.2057 troy ounces, and is a slightly different weight than the Tael used in other Asian gold markets such as Hong Kong, where the Tael equals 37.429 grams or 1.20337 troy ounces. The Vietnamese lượng unit can be divided into a smaller weight unit of 10 chi. Therefore 1 cây or lượng = 37.50 grams, and 1 chi = 3.75 grams. The Vietnam ‘chi’ weight has been produced in the following 5 denominations: 10 chi, 5 chi, 2 chi, 1 chi, and ½ chi. Traditionally in Vietnam, a 37.5 gram gold bar actually consisted of 3 slim gold bars bound together, two of which weigh 15 grams each, with the third weighing 7.5 grams. Given the huge numerical currency exchange rate between the VND and USD i.e. the official rate is VND 21,890 to the US Dollar, the Vietnamese tael gold price will therefore be a sizeable number, for example if the USD gold price is $1,200 per troy ounce, then, the VND price per tael (lượng) will be at least 31,671,328 ($1200 * 21890 * 1.2057). This price conversion is before taxes, import duties, and other supply and demand related price frictions that would tend to make the domestic price higher than a translated international price. As an example of the magnitude of the gold price numbers in Vietnam, the domestic gold price (per troy ounce) rose from VND 20 million at the start of 2010 to VND 40 million in early September 2011, and stayed in a range fluctuating around VND 35 million until early 2013, before falling back to approximately VND 25 million per ounce in late 2013 where it stayed in a range near VND 25 million, until breaking on the upside in early 2016. Gold prices in Vietnam are reported in both US Dollars per ounce and VN Dong per tael, usually with a price differential reported in Dong per tael, for example, the price differential between the local and international price may be 1000,000 Dong per tael. Vietnam is in the major league of gold consuming nations. According to the World Gold Council, Vietnam recorded Asia’s 4th highest investment gold bar and coin demand in 2015, at 47.8 tonnes, behind China, India and marginally behind Thailand. Vietnam also recorded the 6th highest gold bar and coin demand globally in 2015, when adding Germany and the US to the list above. Adding Vietnam’s gold jewellery demand for 2015 of 15.6 tonnes, this meant that total consumer gold demand (jewellery + investment gold) in Vietnam during 2015 reached 63.4 tonnes, which was 7th highest globally, behind China, India, the US, Germany, Thailand and Saudi Arabia. As a one party socialist economy, the fact that the Vietnamese gold market is highly regulated by the State should not be surprising. What is somewhat surprising is that this State regulation went into overdrive from 2010 onward as the international, and domestic, gold prices soared. The authorities believed, rightly or wrongly, that the rising gold price had caused an overheated gold market (with the domestic price higher than international price), and that gold hoarding, which is a permanent habit of the Vietnamese, was stimulated gold smuggling, and had spillover effects on the Dong’s exchange rate since gold imports have to be paid for in US dollars. Private gold trading floor that had proliferated in 2008 and 2009 were banned by the Government in 2010. In 2011, commercial banks were prohibited from engaging in lending and deposit taking activities that involved gold. In 2011, the Government banned gold as a medium of exchange, and the SBV took over gold bar production from the country’s largest producer, while outlawing the production of other gold bar brands. By 2012, the central bank had introduced a system of licensed gold traders, with the only license holders authorised being a small number of large commercial banks and large gold jewellery and wholesale companies. In 2013, the SBV embarked on a series of gold auctions to the ‘market’, in an attempt to stabilise the domestic price. The years 2014 and 2015 were a period of consolidation for the State authorities as they steered the domestic gold market on its new heavily controlled course. “…the gold market is stable, gold supply and demand in the market are relatively balanced, the domestic gold price is not impacted by developments of the international gold price and USD appreciation. In 2015, the international gold price sometimes fluctuated remarkably while the domestic gold market was basically stable with balanced supply and demand. This statement, more than any, provides some confirmation of the goals and intentions of the State of Vietnam and its central bank towards the Vietnamese gold market. It also acts as a suitable introduction as to the State’s and SBV’s roles in the domestic gold market. The Vietnamese Government operates in a world of Decrees, Circulars and Decisions, and for its interventions into the gold market, the Government draws on the State Bank of Vietnam (SBV) as its agent of choice in implementing said decrees and circulars, thus heavily involving the SBV in the management of the Vietnamese gold market. “- To manage the purchase and sale, import and export of gold and foreign exchange, and SBV’s plan on gold bullion production for each period and other activities related to gold as assigned by the Government; to coordinate with relevant agencies in purchasing and selling gold bullion in the domestic market, to mobilize gold from organizations and individuals in accordance with laws.”. Specifically, this management of gold trading extends to gold bullion production, the import and export of gold bullion, the sale and purchase of gold on the domestic market on behalf of the Government, production of gold jewelry, gold jewelry trading, the import and export of materials used in gold jewelry production, the export of mined gold, and the inspection and supervision of the above mentioned activities. As a state monopoly, the Government is solely authorised to produce gold bullion, and it is also the only entity authorised to import and export raw gold for bullion production. Companies can import raw materials used in gold jewelry production, but this requires a license from the SBV. Likewise, companies wishing to trade gold bullion require a licensed from the SBV. To understand the current structure of Vietnam’s gold market, and why the Vietnamese Government and central bank are so heavily involved in creating a highly controlled gold market, requires an understanding of the main events that have occurred in Vietnam’s gold market over the last number of years. The first major decree in Vietnam’s recent economic history concerning regulation of the gold market is Decree 63/1998/ND-CP, dated 17 August 1998 “On foreign exchange management” which, as well as regulating foreign exchange trading, also specified a detailed list of regulations (articles 31 and 32) on the management of ‘gold of international standard‘ and granted powers to the SBV to issue and revoke gold trading and gold import-export licenses, and granted other powers to the SBV to manage the domestic gold market. Gold of international standard refers to gold produced by international refiners/mints, or domestic gold producers that are well-known internationally. Following this, Decree 174/1999/ND-CP dated 9 December 1999, “On the management of gold business activities” addressed regulations on production and import-export for gold ‘not of an international standard’, which included gold jewellery, raw material gold, gold ingots, fine art gold items.The most critical parts of this decree stated that the SBV had the power to grant and withdraw licenses for the production of gold ingots, for the import and export of the relevant forms of gold (gold jewellery, raw material gold, gold ingots, fine art gold items), and it granted the SBC powers to decide which entities could legally trade these forms of gold. Decree 174/1999/ND-CP was then amended slightly by Decree No. 64/2003/ND-CP dated 11 June 2003. Although the domestic gold market was subject to the above Government and central bank regulations during the early 2000s, such as the licensing requirements for gold fabrication and gold imports and exports, the market was ‘relatively’ free for the Vietnamese population to buy and sell gold from a vast amount of outlets and even gold deposit taking by banks, in which they would provide interest on the deposited gold, became popular. Beginning in 2008, numerous gold trading floors were launched by Vietnamese banks. These ‘trading floors’ allowed retail clients to speculate on the domestic gold price, often with the use of banks loans, and so offered customers a very high degree of leverage and encouraged risk-taking. Vietnam’s banks entered this area of business after the central bank tightened lending criteria on the banks’ traditional lending activities in a move to cut inflation. On the demand side, Vietnam’s retail investors and speculators were willing participants in the gold trading floor operations, given their affinity to gold, and also due to having been burnt on the Vietnam stock market when it produced substantial negative returns during 2008. The first gold trading floors in Ho Chi Minh City (HCMC) were opened by Viet A Bank, Southern Bank (also known as Phuong Nam Bank), and Asia Commercial Bank. Eximbank Bank, in a joint venture with Saigon Jewelry Honling Company (SJC), followed suit and opened its gold trading floor in September 2008. Other banks opening gold trading floors included Sacombank /Sacombank Jewelry Co (SBJ) and VietA Bank. Other trading floors not owned by banks also proliferated at that time, including operations opened by the Vietnam Gold Business (VGB) and Vang The Gioi (VTG / World Gold). However, on 30 December 2009, the Government issued a directive ordering the closure of all gold trading floors within a 3 month period, with an ultimate deadline of 30 March 2010. Ostensibly, the Government’s move against the gold trading floors was out of fear that trading operations posed risks to the country’s financial system. In actuality, it was another example of the Vietnamese Government’s war on gold, and the floor closures were the first moves in a new round of the Government’s anti-gold regulations that lasted from 2010 to 2014. The SBV also deemed that all loans that had been used to trade gold (loaned by the banks to the speculators) had to be repaid. This repayment stipulation, and the looming deadline to close the floors by 30 March 2010, actually caused trading volumes on all floors to plummet in early January 2010, as customers scrambled to unwind positions. This led to some operators closing their gold trading operations far ahead of the 30 March deadline. In April 2011, SBV Circular 11/2011/TT-NHNNfn. [SBV Circular, dated 29 April 2011 http://www.lawfirm.vn/?a=doc&id=1779] was issued. This Circular prohibited banks (credit institutions) from engaging in gold lending or deposit taking in gold (which it called ‘gold deposit mobilisation’) with any individuals or institutions. The SBV explained the ban as a way of targeting gold price speculation which in its view was heightened by fluctuations in the gold price caused by gold lending and deposit taking, and that the fluctuating price also increased gold smuggling . 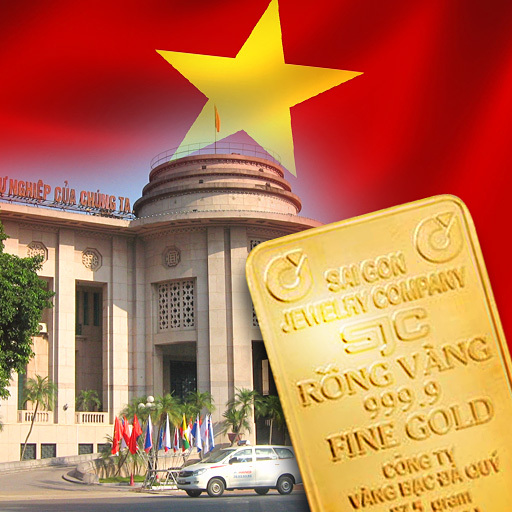 In May 2011, the SBV appointed Saigon Jewelry Company (SJC) as the sole entity authorised to produce gold bars in Vietnam. The rationale for making SJC the national brand of gold bar and monopoly producer was specifically so that the State could control the country’s gold inventories more closely, and therefore intervene more effectively in the domestic gold market, and therefore control the domestic gold price. As other gold bar producers were naturally worried about this monopoly development, the SBV stated at the time that it would allow the SJC branded gold bars to be channeled through these competitors of SJC, companies such as Sacombank Jewelry, Agribank Jewelry, Bao Tin Minh Chau and Phu Nhuan Jewelry. In April 2012, in what would be considered an extreme measure in any country or market, the Government issued what is probably the most critical decree on the Vietnamese gold market, Decree No.24/2012/ND-CP, which banned gold bars as a means of payment, took control of gold bar production into the hands of the State, and implemented a government monopoly on gold import and exports. Decree No.24/2012/ND-CP covering ‘gold trading management’, specifically banned gold bars as a means of payment/medium of exchange, moved to takeover exclusive production of gold bars in the State, deemed itself the sole importer and exporter of gold raw materials, and stipulated that gold bar trading could only be carried out by licensed entities. It also directed that the SBV could hold gold bullion as part of its official reserves. This 2012 decree replaced Decree 174/1999/ND-CP from December 1999, and essentially restructured the entire Vietnamese gold market, re-organising it under State control. Note that trading of gold was not outlawed by the 2012 decree, but going forward, could only be undertaken by entities licensed by the SBV. Thus, at that point the SBV began to control production of SJC gold bars. SJC bars comprised about 90% of the market according to the SBV. Gold bars of brands other than SJC were able to be traded for a transitionary period, after which only authorised bars (SJC) could be traded by companies that had obtained the relevant new licence. This meant that other brand bars ultimately traded at lower prices because the newly authorised traders refused to trade them and the public’s confidence in non SJC was eroded. The SBV then issued Circular 38/2012/TT-NHNN, dated 28 December 2012, stipulating that banks (credit institutions), which had been issued licenses to buy and sell gold bars could only have end of day gold balances (i.e. gold bar and sell transaction exposure) less than 2% of the institution’s capital. Decree 24 stipulated that only 2 types of qualifying entity could acquire a license to trade gold bars; a) enterprises with capital of VND 2 billion or more, with 2 years gold trading experience, and branches in at least 3 Vietnamese provinces or cities; b) credit institutions (banks) with a registered gold business, having capital of VND 3 billion or more, with branches in at least 5 Vietnamese provinces or cities. This ruling shut out the vast majority of Vietnam’s (small) gold traders from legally trading gold bars in the market. Many of these outlets switched to concentrate on trading in gold jewellery, which the Vietnamese uses as an investment and savings proxy for gold bars. When the SBV’s bullion trading licensing rules came into effect in January 2013, it had only licensed 22 banks and 16 other companies to act as authorised bullion traders. As of early January 2013, it became illegal for all other gold traders in Vietnam to trade in gold. Between them, the 22 banks and 16 companies controlled 2,500 trading counters across the country, but this was only a fraction of the 12,00 gold trading counters that were active before Decree 24 came into effect. The intention of the gold auctions was to centrally regulate the supply of gold to the domestic market, in an attempt to lower the domestic price towards the international price (price smoothing), as well as to stabilise the market (price stabilisation). The first auction was 28 March 2013. Overall during 2013, the SBV held 76 gold auctions, and sold a total of 1.82 million taels (approximately 70 tonnes). The domestic gold price fell 24.6% during 2013, however its unclear what contribution, if any, the gold auctions made to this price fall, since during the same period the US dollar (international) gold price fell by 25.5%. The auctions were not resumed in 2014, despite the central bank in early 2014 stating that they would be. Note, even though Decree 24 from 2012 allows the SBV to hold gold as part of its reserves, the SBV has not reported any official gold holdings to the IMF since 2014, despite the fact that it regularly held gold in 2013 as part of an auction / stabilisation stockpile. This gold was most likely not recorded as being part of the official reserves. In February 2013 the SBV prohibited the trading in all other gold bar brands apart from the SJC brand. Saigon Jewelry Company (SJC) is Vietnam’s largest gold and gold jewelry production and distribution company[SJC http://www.sjc.com.vn/?n=1]. It was founded in 1988 and originally operated as a state enterprise under the direction of Ho Chi Minh City’s People’s Committee. SJC runs gold bar and gold jewelry manufacturing plants and has over 200 branded retail shops in Vietnam, and its products are available in over 3000 affiliated outlets throughout the country. As well as the gold sector, SJC is also active in investment and financial services and real estate as well as the gold sector. The ‘SJC’ gold bar brand, with the ‘Saigon Jewelry Company’ and ‘SJC Rong Vang 999.9 fine gold’ logo is the most widely held in the country. Its produced in SJC factories in Hanoi and Ho Chi Minh City. Even before the central bank’s 2012 move to take over gold bar production using the SJC brand, SJC claimed to have a 90% share of the gold bar market in Vietnam. The SJC gold bar range includes 1/20 tael, 1/10 tael, 1/5 tael, 1/2 tael, and 1 tae, and 10 tael denominations, and in 2006 the company introduced a 1 kg gold bar. Phu Nhuan Jewelry (PNJ) is one of the largest jewellery companies in Vietnam. PNJ produces small minted gold bars as corporate gifts in denominations of 0.5 chi, 1 chi, 2 chi, 5 chi and 10 chi (1 luong). PNJ is also involved in a joint-venture with DongA Bank, called PNJ – DongA Bank, which supplies both SJC gold bars and PNJ branded bars in chi, 2 chi, 5 chi, and 1 luong denominations. DongA Bank, of which PNJ is one of the major shareholders, was pus under SBV supervision in August 2015 following alleged illegal activities. Gold trading company MKS of Geneva, which owns the Swiss PAMP gold refinery and has an extensive presence throughout Asia, operates 2 representative offices in Vietnam, one in Hanoi, the other in Ho Chi Minh City. VietnamGold Investment and Trading Cooperation (VietnamGold) is a gold trading and gold import – export company founded by the VGTA, HD Bank, Nam A Bank, Phu Gia Securities, and Nguyen The Hung of MKS Finance (Vietnam), with additional shareholders of EXIM bank, Viet A Bank and Trust Bank. It also counts MKS Finance (Switzerland) as a foreign strategic partner, and companies and banks such as Phu Nhuan Gold (PNJ), Dong A Bnak, Sacombank, Asia Commercial Bank as domestic partners. VietnamGold gold supplies SJC branded bars from its Hanoi office and various other stores, and is making inroads into the gold market in Laos. The Vietnam Gold Traders Association (VGTA), headquartered in Hanoi, was established in 2002 under Government direction. Article 5 of Decree 174/1999/ND-CP had stated that “The establishment of the gold business association and its charter must be approved by the State Bank before submission to the competent authorities for decision”, so this article appears to have been drawn up to address bodies such as the VGTA. The Association’s remit is to coordinate and improve business activities of its members. The VGTA is sometimes referred to as the “Vietnam Gold Business Association”. For a commodity/currency that’s so intrinsic to the national psyche of Vietnam, in a country that’s officially named the Socialist republic of Vietnam, it’s probably not surprising that the Vietnamese Government and the central bank are constantly finding new ways to intervene in, and attempt to control, the domestic gold market and the domestic gold price, and they do so in an open and explicit fashion. The official motto of the Socialist Republic of Vietnam is “Independence, Freedom and Happiness“. However, when it comes to the gold market, the Vietnamese Government seems to have forgotten about the concepts of Independence and Freedom. As to whether the Vietnamese population is ‘happier’ operating in a highly controlled national gold market of strict rules and regulations than in a non-state controlled gold market, that is a question that only the Vietnamese population can answer. But for any statists planning extreme gold market interventions, Vietnam may be the model to follow. Replace the ‘gold standard’ with ‘gold’ in the above quote, and this may well be the most succinct description of the Vietnamese authorities’ fear of gold, fear of the Vietnamese gold market, and fear of the economic freedom which physical gold provides. 28.^ “Sacombank merges with Southern Bank”, VietNam News, October 2015 http://vietnamnews.vn/economy/276532/sacombank-merges-with-southern-bank.html. 44.^ “Gold trading floor plan cops flak”, Viet Nam News, 2013, http://vietnamnews.vn/print/214538/gold-trading-floor-plan-cops-flak.htm.